Launched with just one model in 1989, Lexus was always intended by its parent company Toyota to be a luxury export marque that would see its arrival in America followed by Europe and then other markets. Initially spearheaded by the LS 400 into a marketplace traditionally dominated by long-established Germanic rivals including ‘S’ and ‘7’, Lexus had a tough time to break the mould yet managed to win over 1,158 customers over the model’s lifetime in Europe alone, where its combination of reliability, performance, technology and comfort won it immediate fandom. The company’s portfolio remained small with the LS the sole offering for several years, before being joined by the mid-size GS. And, 20 years ago this year, Lexus introduced the hybrid luxury crossover category with the launch of its RX model, followed shortly thereafter by the IS – a car to once again tackle established rivals, but this time in the highly competitive compact executive market. It succeeded. Today, the Lexus model range spans each of the premium sectors, yet maintains a strong presence in the luxury crossover and SUV segments, with the NX, RX and RX L models. These will shortly be joined by the UX, which will serve as Lexus’ smallest crossover model and is predicted to be a top seller for the brand. It will also be the first Lexus built upon the company’s new GA-C global architecture platform. Though there was initial speculation the UX would be built in Europe, it will instead join the NX in being produced by Toyota Motor Kyushu in Japan. Other new models include the ES that will take over from the GS, while others have recently undergone refreshing, including the RC and CT models. Offering a glimpse of things to come, Lexus unveiled the LF-1 Limitless concept – a flagship crossover introducing new ideas including cameras to replace rear-view mirrors and four-dimensional navigation with haptic feedback. Lexus also used the concept to state that by around 2025, every Lexus model will be available either as a dedicated electrified model, or have an electrified option. 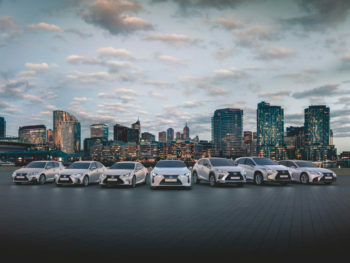 Having built an enviable reputation for reliability and quality and frequently found at the top of driver/ownership surveys, Lexus has seen its sales flourish from humble beginnings in the early ’90s to more than half a million annual sales today. Lexus has consistently grown over its near-30 year lifespan, yet the last year alone has seen an increase in demand for the brand despite the premium market being flat – sales figures between Jan-Aug have increased 6% globally, with significant increases observed in Japan and China particularly (+45% and +23% respectively). In Europe, sales have increased some 7% over the same period too, with growth recorded in several key markets, such as Spain (+19%), Russia (+9%), Poland (+9%), and the UK (+7%). However, a slight decline has been observed in both the North American and Middle East & North Africa (MENA) regions. Despite humble origins just 29 years ago, expansion has been rapid and the brand is currently available in over 90 countries. Although Lexus’ early success was attributable to larger-capacity conventional engines, The brand quickly adopted hybrid power. Today, the company is a leader in luxury hybrid vehicles, with more than 1.25 million hybrid vehicles sold globally as of December 2017. “Self-charging” hybrid power has been central to Lexus’ development, providing a platform that enabled improved fuel consumption, lower exhaust emissions and increased refinement compared to its non-electrified competition and yet crucially ensuring its cars remain seen as offering an engaging drive. Lexus Hybrid Drive was first introduced in the RX 400h and subsequently every new Lexus model has included hybrid versions. Lexus sells more hybrids than any other powertrain in its stable, with a 60% hybrid sales mix globally and 98% in Western Europe – a higher proportion than Toyota’s own hybrid sales. Similarly, hybrids have largely replaced diesels from Lexus’ line-up, with the fuel unfavourable in its largest markets: the USA and China. This, together with its already considerable hybrid sales percentage, effectively spelled a natural end to Lexus diesels. At the other end of the spectrum, Lexus has offered high-end machinery over the years to express its engineering prowess, including the LFA and more recent LC model. These models aid the brand’s sporting image, while also offering a chance for Lexus to show off what it’s capable of – the LFA’s V10 engine was, for example, capable of 553bhp at a soaring 8,700rpm – at the time one of the most powerful production engines ever made. While headline figures like those may not impress, it’s the execution that did. Lexus engineers had to reinvent certain components and create new materials to cope with the output – some of which have begun to make their way into mainstream models offered by the brand, such as a digital rev counter. Today, Lexus produces its highest-performance models under its F marque division, which now adorn the RC F coupé and GS F saloon, the latter likely to be replaced soon by a new ES F.
Lexus additionally expends large amounts on safety, as well as comfort and luxury for occupants of its vehicles to enjoy. For example, the new ES saloon received top honours at Euro NCAP crash testing, while its seats and noise, vibration and harshness underwent three years of development to ensure maximum comfort and refinement. Branching out from cars, Lexus unveiled its first super yacht in September 2018 – the 65-foot Lexus LY 650 – which is expected to be completed by the middle of 2019 and adds to Lexus’ other explorations into non-automotive ventures including culinary, film, design and other select luxury lifestyle experiences. I have decided to “redesign” Toyota from a car-making company into a mobility company. A mobility company is a company that provides services related to movement for people around the world. I view this once-in-a-century era of profound transformation, the likes of which come only so often, as a major opportunity. My thinking is that the more we advance new technologies, such as those related to electrification, automated operation and connectivity, the broader the potential of automobiles will become. It’s been said that data is the new gold and that software is the key. But I would argue that we’re moving from software to the platform as the thing we’re all after. It’s the platform that will be the backbone for mobility as a service for autonomy, for car sharing, for any number of services that we want to make possible. That’s why two years ago, in partnership with Microsoft, we launched a standalone company called Toyota Connected. With Toyota Connected, we hope to become just as well-known for the Mobility Services Platform we’ve developed to manage large fleets of vehicles and all kinds of connected services. We want the car to be a seamless extension of your phone and computer, a kind of personal assistant on wheels, able to anticipate your needs through predictive artificial intelligence. There is much work to be done to increase consumer demand for all electric vehicles. That’s why we are working on new solid-state battery technology, which we believe will make them smaller, lighter, and most importantly, for both consumers and automakers, much more affordable. This new form of electrification, combined with our Mobility Services Platform from Toyota Connected, and our autonomous technology from TRI, are the key components in our vision of future mobility services and mobility commerce.